Humberto Vélez, The Underdog (EVA International Cup 2014). 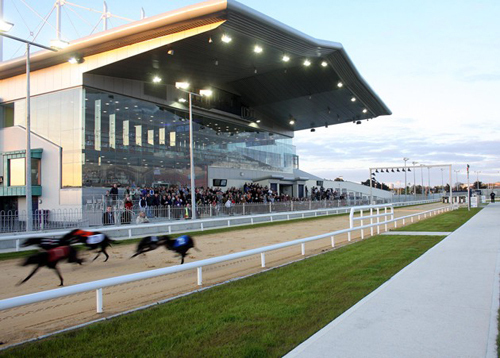 Performance view, Limerick Greyhound Stadium, Limerick City, Ireland. The biennial is spread out over multiple venues throughout Limerick City. On view at the University of Limerick Gallery, Uriel Orlow’s Unmade Film, 2013, is a collection of separate components for an unproduced film, including a script, music, props (an olive-oil bottle), and music. These cumulatively create a haunting journey through layers of time and meaning centered around Jerusalem’s Kfar Shaul mental hospital, which was built on the site of a a massacre by Zionist paramilitary groups in 1948. At the Hunt Museum, Bisan Abu-Eisheh’s Playing House, 2008–11, also addresses Israeli issues, with an installation echoing the museum’s archival and presentation practices. Here, the objects are contemporary artifacts such as kitchen utensils, plastic toys and articles of clothing salvaged from demolished homes in the West Bank. Also at the Hunt, Ann-Sofi Sidén’s Lunch to Last Call, 2014, is a silent, black-and-white, nine-channel video filmed over twenty-four hours in a Limerick City bar, Costello’s Tavern. Citing Charles Dickens’s line “All these things I saw without then knowing that I saw them,” Sidén has created an experience that is intimate and compelling without being voyeuristic. Other standout works from the more than thirty projects include Alon Levin’s End to the Grand Gesture, 2011–14, a monumental sculptural installation at the Limerick City Gallery of Art. EVA’s theme this year is “Agitationism,” and at a fomer factory, reclaimed for EVA as an exhibition space, the perfectly paced selection includes delicate yet strong pencil drawings by Ann Böttcher, powerful video works by Patrick Jolley and Doa Aly, and Garret Phelan’s zine-inspired ink drawings that cumulatively address the question of how art can agitate, disturb, make change.